Are tariffs the only way to stop outsourcing? This perspective has been widely debated as the U.S. engages in trade wars with China, Mexico and Canada, but it ignores many of the realities of how companies actually make sourcing decisions – and the ways they naturally consider national interests when making them, writes Wharton operations, information and decisions professor Morris A. Cohen in this opinion piece. We are in a period of intense global economic warfare. The U.S. is engaged in trade disputes with China, the European Union, Mexico, and Canada. We have been told that trade is a zero-sum game with one country’s gain coming at the expense of another country’s loss, and that a trade war is imminent. What is missing from this perspective is the fact that countries do not make the decisions that determine the flow of goods across borders; companies do. Governments attempt to influence company decisions by measures such as tax legislation or tariffs. But in the end it is the individual company that decides where and how products are made and distributed. Companies are influenced by government policy, but they need to promote their own profit and growth objectives. It has been argued that the actions of countries to protect the interests of their citizens could lead us into a lose-lose outcome, where both companies and countries are worse off. This is a high stakes and politically explosive game that affects both workers and consumers. The continuing changes in the sourcing of manufacturing products has led to economic disruption. A major restructuring of global supply chains is ongoing. We recently conducted two benchmark surveys with over 100 manufacturing companies responding, (Cohen et al ), in order to explore what is actually happening and the rationale behind company decisions. The data collected in this survey was based on recent company decisions concerning the location, capacity, capability and utilization of manufacturing facilities worldwide. The results confirmed the continuing globalization of supply chains, where the provenance of a manufactured product typically includes parts and components that have been sourced from suppliers from all over the world. Companies operate complex global infrastructures with plants and facilities located in multiple countries. Every time a company makes a decision that transfers manufacturing activity from one location to another, a linked network of suppliers, distributors, and service providers is impacted, along with consumers. Much of what we observed in our survey was expected. China continues to be the most attractive region for production sourcing (45% of companies surveyed reported making investments in manufacturing in China). However, cost was not the sole driving force. Market access, quality, and supply chain performance emerged as dominant drivers for increasing production volume in China. Labor costs are, however, what has driven some companies (11% of our sample) out of China to other Asian locations such as Vietnam. The emerging economies of Eastern Europe & Russia were the second most attractive region for offshoring. Western European countries utilize neighboring countries to obtain nearshore cost advantages. While Western Europe is the region with the largest outflow of production, North America reported a modest growth in production volume, with more companies investing than divesting. Most of these investments come from companies with headquarters outside of the U.S.
Let’s now consider the problem from a company perspective. Companies seek to maximize global performance in a manner that is responsive to the incentives, constraints and penalties imposed on them by countries in which they do, (or could do) business. One way that companies do so is by making decisions on where and how to manufacture their products, i.e. they must solve their global sourcing problem. As global production supply chains have become more inter-connected and integrated, the range of options and the consequences of shifting manufacturing from one jurisdiction to another have become more complex and difficult to analyze. Firms recognize that manufacturing sourcing decisions have long-term strategic consequences and require complex tradeoffs and risks. Companies try to adopt strategies that will maximize global performance based on a metric such as global after-tax profit, income, market share, or growth subject to constraints derived from their technology, markets, supply chain and government actions. They do so through the operation of highly integrated global supply chains. A major driver of the changes in manufacturing sourcing that have been occurring for some time, is the huge disparity in labor costs between developed economies (such as Germany or the U.S.), and those that are less developed (e.g. China or India). The rate of change in labor costs, however, has been changing – for example, China’s labor costs are increasing much more rapidly than the U.S. There are those that predict the economic advantage of Asian offshoring will soon disappear. The pattern of sourcing capacity shifts that we observed, and the range of drivers reported, indicate that global sourcing is no longer a “no brainer”, whereby companies, in a herd fashion, make choices based on the single dominant reason of reducing their labor costs. Countries, on the other hand, have a wide range of policy instruments that they can use to influence and control the decisions of companies that operate within their borders, i.e. corporate taxes, duties, tariffs, quotas, content requirements, capital flow regulations, investments, fines, or simply the threat of adopting these measures. A model of country behavior is to develop policies that maximize the welfare of their citizens. This includes providing a safety net and relief for those citizens who are “losers” in the global sourcing game, i.e. they have been laid off or their economic prospects have been diminished. The “winners” in this game, at the citizen level, are all of us, who as product users and consumers have access to lower cost, higher-quality products that are produced, delivered and supported by the global supply chains operated by companies. The “winners” at the country level, are those countries who have expanded their manufacturing and exports. As our survey corroborates, China has clearly been a winner for some time, and developed economies have been losing. Perhaps the most significant observation that has emerged from our study is the observation of a pattern of decision making that we call “natural hedging.” This occurs when the share of production and sales volume is balanced, i.e. when production and sales activities are co-located in a region. A perfect natural hedge occurs when, for a firm in each region, local production equals local sales. As we can see in the figure below, for most regions (e.g., Western Europe, Japan), the share of production and sales volume was balanced (based on averaging responses from all sample company respondents concerning the global distribution of sales and production). For example, on average, 20% of production occurs in North America while 25% of products are sold in the North American market: a mismatch of just 5%. However, for China, local production volume is more than twice that of local sales volume. Much of what our sample companies produce in China was exported. This finding is in line with the offshoring activities of the past decades. Similarly, given the fact that many North American companies engaged early in large-scale manufacturing offshoring to China, it is not surprising to see that in North America, more is sold than produced. At a more granular (firm) level we observed that despite the fact that all of the companies in our sample, whether small or large, engage in international business, many companies rely heavily on their home regions — defined as the region where the business unit’s headquarters is located — for both sales and production. 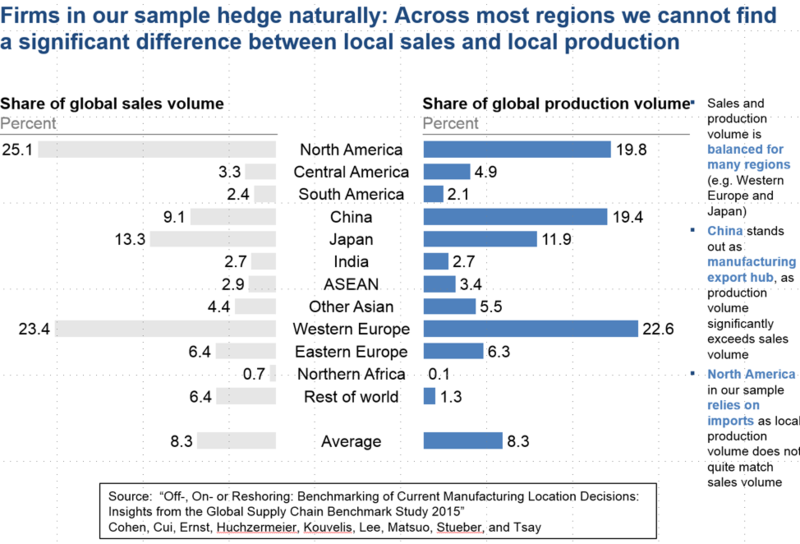 Across the sample, we observed that a company’s home region is in most cases not only its largest market but also its largest manufacturing source. The regions where the business unit’s headquarters are located account, on average, for 44%–64% of sales and 31%–77% of production volume. North American firms seem to depend the least on their local market. We observed that 44% of sales occurs in North America while only 31% of global production volume is manufactured at home; by contrast, Europe accounts for 52% of the sales volume of European firms and for 62% of the global production volume. This is a high number for production given the relatively high factor costs in Europe, but it is in line with the recent history of global manufacturing. American firms had quickly shifted production to China over the past few decades, which accounts for 30% of North American production. European firms, however, were more hesitant to do so and have been more successful in adopting policies to protect domestic manufacturing. Maintaining a natural hedge balance at the company level has a variety of benefits that include reduced risk due to currency change, reduction in the lead time to the country market which leads to increased flexibility and responsiveness, the potential marketing value of local presence, and a lower chance that governments will enact rules or introduce incentives that will punish those companies that are not acting as good “corporate citizens”, i.e. by not implementing a strategy of natural hedging. A possible disadvantage is that natural hedging is a less sophisticated global sourcing strategy that may be suboptimal for a company compared to strategies based on automation or market penetration. One conclusion that is suggested by our observations is, that contrary to the impression based on current headlines, companies, to a large degree, adapted to the policy goals imposed on them by governments and in many cases have voluntarily adopted a policy of natural hedging, even as they seek to win in the brutal economic war associated with production sourcing. Countries and national interests influence companies and many companies look for ways to optimize their performance while conforming with multiple country priorities. This leads us to a more optimistic conclusion that an accommodation of interests can be achieved through voluntary company sourcing decisions, without the imposition of drastic or punitive measures by governments. As companies seek a natural hedge by balancing their global manufacturing and sales, there can be an ultimate win-win solution to the global sourcing game. While it’s true that some companies are bringing manufacturing back to the U.S., just as much new outsourcing is underway, according to Wharton's Morris Cohen. Experts say no. But the real question is: Does manufacturing really need 'saving'? With any new implementation of US trade embargos, tariffs, and etc. by elected US Government politicians and their unelected US Government bureaucrats, the US Government is assisting selected US business sectors (and their US Labor Unions) by economically placing foreign manufacturers at an economic disadvantage when they are offering their products for sale in the USA. These elected US Government politicians and their unelected US Government bureaucrats are then picking and choosing the winners and the losers among US business sectors (and US Labor Unions) by implementing US trade embargos, tariffs, and etc. that are sufficient to economically reduce and/or eliminate economic competition from these foreign manufacturers! This selection of winners and losers is and will be selected based upon the existing established institutionalized political “Pay to Play” procedures that are now required for doing business with the US federal government and or getting any US government action on any issue! These elected US Government politicians and their unelected US Government bureaucrats are also picking and choosing US business sectors and US Labor Unions by awarding compensation from the US Treasury to those businesses affected by the elimination of free trade agreements. Of course “Pay to Play” procedures will determine the selection and monetary amounts of these payments! In any trade war, the nations that accumulates more (taxable) wealth VIA FOREIGN TRADE within that nation wins, and some nations go bankrupt by spending their existing wealth, plus borrowed money using their existing privately owned taxable wealth as collateral for Government loans to pay for their nation’s government activities lose! The USA will probably lose Mr. Trump’s new trade war because the USA is no longer a taxable wealth creating nation, but is now a taxable wealth consuming (wealth destroying) debtor nation as indicated by our increasing national debt to pay for our nation’s government activities. US citizens are selling (or letting the government mortgage privately held US located assets as collateral for US treasury bonds) existing title to every privately owned national taxable wealth (businesses and real property) in the USA that was created by previous working generations of their citizens in order to pay for our government payrolls, entitlements, contracts and other government activities (plus compensate for our negative foreign made consumer product trade imbalance). This creates a constant flow of TITLE to US privately owned taxable wealth generating assets being transferring to individuals in the wealth creating industrialized nations. The US government is now borrowing privately owned wealth (US Dollars) back from the wealth creators (mostly in Asia) to pay for US wealth consuming government contracts, services such as US government payrolls, US government entitlements, infrastructure replacement, and other US government activities that do not create any new taxable wealth to pay for US government activities and using title to our US located privately held assets as loan collateral! Most of the recently industrialized (mostly Asian) wealth creating BRIC (Brazil, Russia, India, & China) nations are now creating and accumulating new privately owned wealth and jobs for their citizens in their own BRIC nations by making things and then selling those things to wealth consuming people in other nations so that some of these industrialized BRIC nations newly (BRIC in-country located) created wealth can be confiscated by their BRIC nation’s governments via taxation to pay for their own BRIC government payrolls and other BRIC government activities without borrowing money. Foreigners from the BRIC nations are immigrating to the USA as they purchase title to our US located assets and then they will eventually become the major (or maybe the only) source of employment for US citizens after they redeem their US treasury bonds and US dollar (electronic) credits that they earned, by making the things that US citizens bought and consumed, for title to and control of (most all of) the businesses located in the USA. How many things that you buy every year are made in Communist China, or Mexico? If Trump imposes a 30% Import Tariff on those items made in those nations, then you will have to pay at least 30% more for those items. Even if the President Trump repeals or re-negotiates President Clinton’s NAFTA and President Clinton’s PNTR for Communist China, those higher paying (STEM) manufacturing jobs are not coming back to the USA from Mexico or Communist China because the manufacturing equipment has been relocated to those low wage foreign nations and US citizens will not work for the wages and benefits available to businesses in those nations.